Improving the usability of digital devices with lessons from mechanical and electrical technology. I’m no more time-obsessed than the average suburban resident of the northeast United States, which means when my Fossil Philippe Starck digital watch died, I was faced with the serious crisis of not being able to know the exact time at a glance anywhere I am. It would take days or even weeks to go through the predictable ritual of shipping off the watch for repair under warranty, having repair refused, and then shopping for a new digital watch, the latter itself a protracted affair because I’m a digital watch power user, demanding all the features: multiple time zones, alarm, stop watch, and a timer. I take time a little seriously. I had a business trip to San Antonio the coming week. Having a watch or not could mean life or death. I mean, what if my plane crashes on an uninhabited South Pacific island (slight navigation error), and, oh gosh, my rescue depends on determining my position by measuring shadows in the sand and referencing Universal Coordinate Time? I needed an Emergency Contingency Watch to tie me over. Down from the closet shelf came the box holding my retired watches, all loaded and ready with utterly dead batteries. Except one. 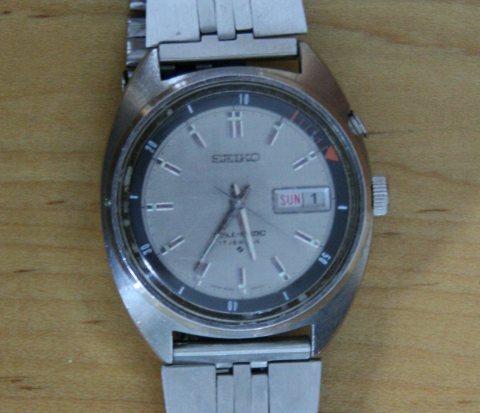 My father’s fully-mechanical 1971 Seiko Bell-matic, given to me sometime in the last century when he went digital. Back then, I called it my “Y2K watch,” one I was sure I could rely on when civilization collapses on January 1, 2000, and, worse, all digital watches loose their ability to keep time. Built on the eve of the digital age, the Bell-matic is an impressive manifestation of mechanical technology. It’s practically accurate, gaining maybe a minute per week. It’s self-winding, getting its energy from the wearer’s normal wrist movements. Hands and numbers are dabbed with phosphorescent paint for night reading (no need to push a light button). It has day and date counters. It includes an alarm. Sorry, no stop watch, let alone timer or multiple time zones, but this is an emergency. After I shake it a bit (to quickly wind the self-winder), it was on my wrist and running. Crisis averted. It’s about a year later, and it’s still on my wrist and running. Clearly, I’m in no hurry to replace this Emergency Contingency Watch. I could pick up a cheap digital this afternoon, and it would have more features and be more accurate than this little can of springs and gears. How can 40-year-old technology compete with today’s offerings? It would seem that in making the move from electrical and mechanical devices to digital, some basic principles of human factors were forgotten. In the move from analog to digital technology, there was also a tendency to move from analog to digital displays: dials and gauges were replaced with numeric counters. In some cases, this is an improvement. It’s easier to get an exact reading from a digital display, down to whatever decimal place is shown. 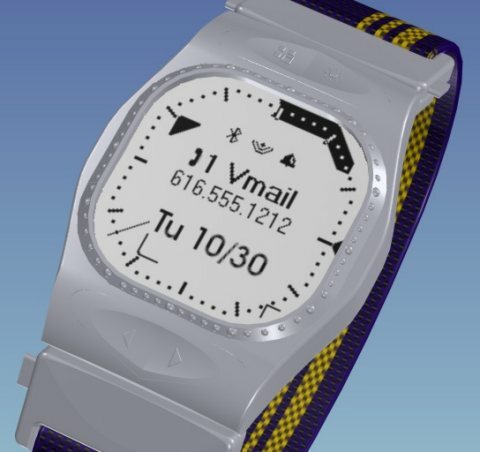 Digital displays can often be more compact than equivalent mechanical displays, especially for large ranges of values, so you can fit more information on a given patch of real estate such as a wristwatch face or cell phone display. Digital displays are easier to simply read, having none of this translating big-hand-little-hand to actual numbers (much to the rejoicing of second graders, I’m sure). Digital displays are particularly preferred when the underlying variable they represent is functionally qualitative rather than quantitative, such as radio frequency or TV channel. It’s not like a radio station at 120.5 MHz has more of anything meaningful to the user than one at 98.3 or 88.7 -the frequency just serves as an identifier. However, when the underlying dimension is functionally quantitative, such as with time, analog displays have several advantages. They are better at getting an approximate reading at a glance. With a quick look, I might mistake 9:57 for 9:53, but I’m much less likely to mistake 9:57 for 9:27, as can happen with a digital display. Even for my level of time obsession, it’s usually more important to get the general time right than the exact time. This becomes especially important when working under suboptimal viewing conditions, where users need to read a display that might be in the distance or partially obscured, such as the timer on a stove from across the room. 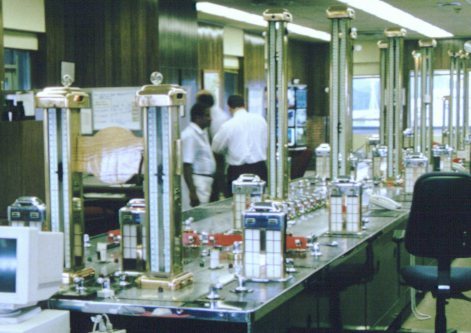 Below is pictured the controls for the Miraflores locks of the Panama Canal, one of the most extraordinary exercises in proto-human factors engineering. Over 90 years old, the vision behind its design is still relevant today. What you’re looking at is an analog of the locks themselves. All locks at Panama were built in two sets physically parallel to each other, allowing two ships to be locked simultaneously. In the picture above, each of the two light gray strips running down the center of the table represents a lock set at Miraflores. The brass towers set in the middle of the strips are depth gauges, showing the amount of water at that place in the locks. Height of the water corresponds to the height of the black needle in the tower. How intuitive. The approximate value can also be read from a substantial distance at practically a 360 degrees range of angle of view, both essential features in the lockmaster’s job, which involves walking about. The “intuitive” aspect is another advantage of analog displays. Digital displays may be easier to read, but analog displays are easier to interpret, to relate the value the user sees to the context. With analog displays, by representing values spatially, it easier see the value in relation to other values. The range of the scale on the display provides clues to the range of acceptable values. Looking at the depth gauge of tower in the foreground, you’d probably say with confidence that that position of the lock is about half full of water, even without being able to read the actual numbers. If a digital display read simply “42,” what would that mean to you? The same is true for my Bell-matic. Physical points on the watch face come to have functional meaning -early, late, time for lunch. Often what is important is not so much the current time, as how much time relative to some other time. With time represented by the spatial layout on the watch face, I look to see the distance to a target time, which I find easier than reading the current time and performing mental subtraction. To track how long something is taking, I turn the orange alarm pointer to the current time, and watch the distance grow. I only miss having a stopwatch feature when I really need to precisely time something to the second. As the user gains experience with an analog display, the physical distances as well as the positions come to have functional meanings without referencing the actual numbers. I find I have less need for a multiple time zone feature because I’ve learned to know how far three or five time zones are on the watch face. I look at the hour hand, look forward or backward the proper amount, and I can tell, without really knowing the actual time, whether it’s an okay time to call California or Great Britain. Finally, analog displays better communicate rates of change of the underlying variable. With a quick look at the depth gauge, the lockmaster can tell how quickly the water level is changing in a lock and how soon it will reach a stable level. Rapidly changing values often require timely intervention (think altitude in an airplane). With analog displays, the amount of change is proportional to the amount of motion in the display, making it a natural attention-getter. Flickering digits in a digital display are harder to interpret. Overall, analog displays have the potential to communicate more information more easily than digital displays. But too many digital devices opt for cheap digital displays. In addition to clocks and timers, my oven temperature and microwave cook levels are shown digitally. Cars have occasionally flirted with digital speedometers, before regaining their senses and returning to analog dials. Looking at the photo of my watch, what time was it when I took the picture? 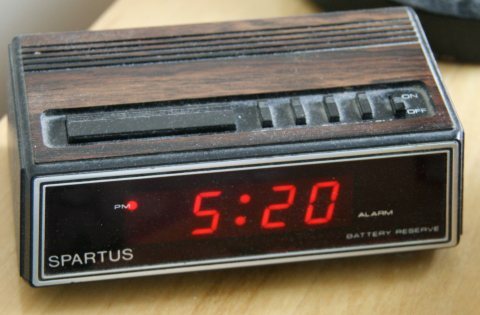 What time was the alarm set to? Cool, huh? You can see both, and I didn’t even have to use an animated GIF. Each variable or attribute has it’s own display. There’s no need to press a button to switch modes to see both the time and the alarm setting. Likewise, the Panama Canal lock control table has separate displays for each element: water depth, gate state, and valve status. No one would consider using the same display for multiple purposes, say the same gauge for the water in separate lock sets, with a switch to select which set. That would be silly. What if the user forgets which lock set is selected? Digital devices, in contrast, like to re-use displays, having modes for different information. My digital alarm clock, for example, requires that I press a button to see what the alarm is set to. The effects are predictable. Once in a while I forget to set (or reset) the alarm to the correct time. With no full-time display of the alarm time, I fail to notice anything amiss. Oh well, I’m sure the boss will understand. What I actually do is just never change the alarm setting. I get up at time the alarm is set to, even when I don’t necessarily have to get up quite that early. Either that, or I sleep until I wake on my own. It’s not worth the risk of changing things. Talk about the user adapting to the machine. My stove uses a single display for the clock, timer, and oven temperature. Unlike the alarm clock, these modes are not under direct control of the user. If the timer is set, the only way to check the temperature is to change it, to trick the display into Temperature Mode. As a veteran chocolate chip cookie maker, let me assure that there are two parameters that are critical for baking: temperature and time. However, in improving our stoves in the digital age, it was decided I only needed to know one at a time. As for the clock, fortunately, I wear a pre-digital watch, so I don’t have rely on the digital stove. My VCR/DVD player is the worse. A single display is used for time, tape counter, channel, operation (play, fast forward, rewind), and just about everything else. Once in a while I record the wrong channel because the display is showing how much I’ve recorded rather than what I’m recording. Compare that to this 1980’s era VCR, with separate display for the counter, channel (going only to 13, belying its age), operation, even tape speed (click for larger). Like the stove, the newer VCR/DVD player has no user override. The VCR/DVD, which has the intelligence of a flatworm, will decide what I need to know. Skipping to a particular counter value is a fun game. Press Fast Forward, and the display says “FF,” until it gets bored with saying that, and shows the counter instead. Oops. Too far. Rewind. Thank you, yes, it’s “RWD”ing. Ah. Too far back now. If I can figure out the rate of fast-forwarding and rewinding, maybe I can time how much to do with my watch…. Maybe I should title this section “Control,” because as far as digital devices are concerned, there is only one control: a button. Levers, knobs, switches, dials, joysticks, and more have been largely excluded from the digital club. I’m confident that will change, however, thanks to the advent human factors standards that require certain controls for appropriate purposes. Take MIL-STD 1472, for example, which just came out in… oh, 1968. Crikey, that’s older than my watch. Speaking of my watch, it illustrates the control most desperately needed in digital devices: the knob, ideal for setting a variable that is continuous, like the time. Turn a knob a lot, and it changes the parameter a lot, a little changes it a little. Turn it quickly it changes quickly, slowly changes slowly. The interaction with the control is a perfect analog to the underlying variable. If you’re lucky a digital device attempts to set a continuous variable with two buttons, one for more and one for less. My digital home thermostat, my oven temperature and timer, and the volume on my TV (including the remote), cell phone, and GPS all work that way. I’m hard pressed to find a digital device that has a knob, with the exception of the Canon EOS XTi camera on the desk beside me, which I used to take some of the pictures for this post. The Apple iPod click wheel is essentially a knob (or rotary switch), so when it became the UI benchmark on which other devices would be judged, I was hopeful we’d see a return to knobs and other continuous hardware controls. These hopes were deflated when the iPhone became the next benchmark, with its single power button (more on that later) and two more buttons for volume control, a particularly disappointing design choice by Apple, especially considering that a knob or click wheel could solve the orientation ambiguity problem the volume buttons have. The problem with using buttons for a continuous variable is that they require breaking the variable into discrete increments. If you make the increments too large, the user cannot control the variable finely enough. This has been my experience with the zoom on a Nikon Coolpix digital camera with its motorized optical zoom. Press either zoom button and it cranks, reaching maximum or minimum zoom almost within the boundaries of human reaction time. With some quick light jabs at the buttons, I could get approximately the framing I wanted before I said, screw this, I’ll fix it in Photoshop. I can’t understand why this has to be electric at all. This isn’t the Palomar Hale telescope -the optical elements are small and light, and could easily be moved by a simple finger-powered mechanical control, which would also save battery life. 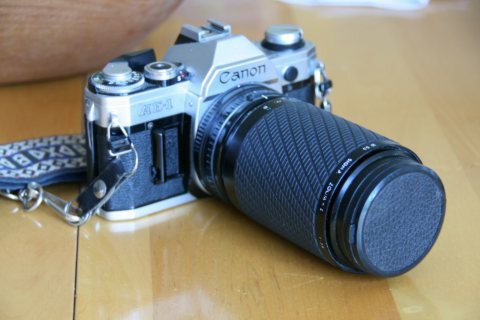 The manual zoom on this much larger Sigma lens from an early 1980s film camera worked much better. The user pulled the textured sleeve forward and back to zoom. Turning it focused (this was pre-autofocus). I guess if it’s digital, just has to have buttons. It’s a decree by the Evil Overlord of Digital. You can have separate buttons for large and small increments. This is what I’ve seen on nearly every digital clock or watch, with a button (or mode) to separately set hours and minutes (yeah, like pressing a button dozens of times to set the minutes is acceptable). This wouldn’t be so bad if The Evil Overlord of Digital hadn’t put a Two Button Limit on any single variable, because inevitably the users have no choice but to increase the hours and minutes -they can’t decrease them. Firstly, that doubles the press-pressing necessary (up to 59 times for minutes). Secondly, that has low error tolerance: if the user goes one too far, then it’s all the way around again. Bummer if you meant to set the minutes to 59 and got 00 instead. This is another reason I avoid changing my alarm clock setting. It’s too much of a pain, so I rather do without a little sleep. In contrast, setting the time or alarm on the Bell-matic is a breeze. I’ve discovered that the reason I like a timer on a digital watch is because setting the alarm for the same effect is too difficult. With the Bell-matic, if I want to alerted when 30 minutes passes, I set the alarm to 30 minutes from the current time. Pull, turn, push, click. I mentioned that the Bell-matic gains a minute or so per week, but given how easy it is to correct the time, that inconvenience balances the abuse that digital watches deal out. Ironically, the digital age mitigates this main disadvantage of mechanical watches over digital. Setting the time on a mechanical watch may be easy but it used to be that getting an accurate time to set it to was nontrivial. Today, however, I’ve a VCR, cell phone, and GPS each displaying a highly accurate broadcasted time signal. Switches are another device from the electromechanical era that were left behind in favor of buttons. For example, where switches have traditionally been used to power things on and off, computers, cell phones, GPSs, home audio and video electronics, stoves and other appliances, even my flashlight now use buttons. Where knobs are for setting a continuous variable, switches best are for setting a nominal state (like On and Off). A switch’s main advantage over a button for this purpose is that each state has a unique look, feel, and user behavior. This can be seen in on the Panama Canal control table. In the picture below, those two beefy handles in the foreground are switches for valves, whose states are indicated by the vertical display behind the switches. 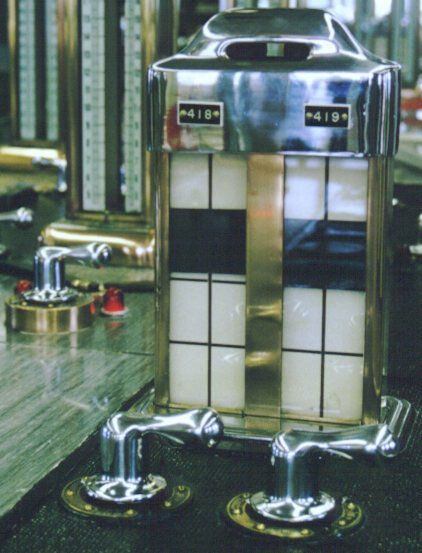 Right now, both switches are set to close the valves, and the valves are in the process of closing as represented by the descending black rectangles in the display (these valves happen to be enormous vertical slides like one of those doors from Get Smart). If the handles on the switches were turned perpendicular to the face of the display, the valves would be set to open. It’s clear when the switch is turned enough to be in one state or the other. The user is unlikely to mistake opening for closing because each requires different user actions (direction of handle rotation), and results in a different visual state of the control. Furthermore, discrepancies between the switch appearance and the display can used as the first step in troubleshooting. If the valves aren’t closing in the display, but the switches are set for Close, then the problem isn’t due to someone forgetting to turn the switch. This is loss when buttons are used instead. My Garmin GPS has a single button for both powering on and off. One morning as I was about to depart on a long trip, I hit the button, and nothing happened. Being a button, with no visual feedback of it’s state, it was possible I didn’t turn it on “enough,” so I press the button harder, and maybe I try a third time. At this point I remembered I had turned the brightness down the last time I used it, and suspect it’s turning on fine, but I just can’t tell. Good news: I remembered how to turn up the brightness once it finishes booting. Bad news: now that I’ve pressed the button an unknown number of times, is it booting or shutting down? How long do I have to wait before trying the brightness adjustment? I give up, and remove the GPS from its cradle and take it in a dark room inside the house. My wife has had a similar experience with the power button on her laptop, when trying to bring it out of hibernation. If nothing happens, is it just being slow? Did she press hard enough? If she presses again (harder and longer) will she force it to reboot instead? And it’s not just my household. Precious seconds were lost in fighting a fire aboard a Canadian destroyer because the same button that turned the fire-suppression system on also turned it off. I guess someone didn’t read Canada’s equivalent of MIL-STD 1472. Such ambiguity disappears when switches are involved. There’s no chance of turning it off when you mean to turn it on because it’s different behaviors. It’s clear literally by look and feel when you’ve fully commanded a state change. Why do digital devices eschew such well understood UI elements like gauges and knobs? The use of buttons in place of switches is understandable where space is tight while features are many, such as on a cell phone, so you have to use multi-mode buttons. This doesn’t apply to knobs, however, which can be multi-mode; the single knob on the Bell-matic, for example, actually performs three functions. Buttons rather than switches may also be a good idea for devices that change state automatically, although my Canon XTi (being the rebel it is against the Evil Digital Overlord) manages to have automatic power-off while also using a switch for power. Redundant controls, such as when a remote is supplied, can also be an argument for using buttons. Finally, buttons, or more specifically touch-sensitive buttons, such as found on my stove and microwave, may have user benefits, not in appliance use, but maintenance: they make it easy to clean the appliance. Barring use of a switch, having a button for each state (or use of a momentary switch) will at least remove the ambiguity of the state the user is commanding. Indicator lights or other annunciators beside or in the button can be used to indicate the commanded state. My digitally tuned stereo amplifier uses buttons to set the input source (radio, CD, tape player, etc. ), when older amplifiers used switches (click for larger). Buttons were advantageous in this case because my amp has a remote and also happens to have a feature where it will switch modes automatically based on events on connected compatible components. For example, if you press Play on the CD player, it automatically switches the amp to CD input. That’s an improvement in usability. But then they blew it by putting input indication strictly in a general-purpose display far from the buttons. After I finished listening to a tape one day, my wife came home to play the CD. The amp dutifully switched over to CD (and said so on the general purpose display) but she couldn’t hear anything because the amp was still set to Tape/Monitor (which was also shown in the general purpose display, but in small print). If there were a big LED lit on the Tape/Monitor button (something the old VCR pictured above does for critical buttons), I suspect she’d have figured it out. She didn’t, and couldn’t listen to music until I came home to troubleshoot. Critical usability failure. I suspect, however, that digital device makers in general don’t get usability or human factors. Maybe the only reason they used things like switches and analog displays in older products was due to tradition or available technology, more than any human factors standards. Maybe they went to multi-mode buttons and displays because they thought that gave the device a modern look. My basis for this suspicion is that too often I see device manufacturers go out of their way, spending extra effort, to make something less usable. My microwave oven, for example, beeps when it’s finishes cooking, an entirely unnecessary signal since the absence of the cooling fan blasting is signal enough. Worse, it will continue to beep at regular intervals until you open the door, which is irritating as hell when I’m busy with other things to get dinner ready, and, you know, despite that insistent beeping, it isn’t at all necessary for me to take the food out of the microwave RIGHT NOW. The astonishing thing is some designer actually made an effort to include that feature, which was approved, coded, and entered production. I also see evidence of a lack of a tradition of usability among digital device designers in the computer software that accompanies digital devices, which is consistently the most horrendously unusable crap I’ve ever seen displayed on a monitor. GUI software has the equivalent of knobs (sliders and scroll bars) and switches (check boxes, option buttons, dropdown lists). Analog displays, in the form of charts, graphs, sparklines, and other graphic elements may be underused, but they’re more common than on digital devices. However, the software for digital devices typically don’t use any of them. Worse, software for digital devices often don’t use any standard GUI controls. Instead the designers choose to invent (badly) their own controls. Here, for example, is the UI for the software for the DVD player installed in my computer. Okay, at least the designers used a slider for the (unlabeled) volume, but meanwhile, they inflict on the rest of the UI all the violence heaped on digital hardware, from which they apparently drew their inspiration. They made custom controls to do it. They spent extra money to make it harder to use. Sometimes poor usability is the result of attempts to save money. When you’re talking commodities like alarm clocks, DVD/VCR players, and kitchen appliances, shaving a few cents by using buttons over knobs, or re-using displays, can add up over a million sales. Apparently, it’s cheaper to write a little extra firmware than use the right controls and displays. I’m sure someone made VP by eliminating a switch here or there. I mean, we all know that usability doesn’t sell. Meanwhile, I’m not buying any watches. Problem: Modern digital devices lack the usability found in previous electro-mechanical devices. Use digital displays when variables are functionally qualitative. Digital displays may also be preferred when space is limited and the range is large. Use analog displays for functionally quantitative variables. Analog displays are particularly preferred when the user needs to compare the current value to a target, or assess the rate of change. If displays must be reused, provide users with a means to override any automated changes in what is displayed. Use knobs and other continuous controls to control continuous variables. If buttons must be used, supply buttons to increase and decrease the variable, and use separate buttons to change the variable at different rates. Use switches to control different device states. If buttons must be used instead of switches, provide a separate button for each state, and provide a proximal display of the state commanded. Use standard GUI controls for desktop software accompanying the device. This entry was posted on Monday, June 2nd, 2008 at 10:14 pm	and is filed under Non-HCI. You can follow any responses to this entry through the RSS 2.0 feed. Both comments and pings are currently closed. I’m somewhat of a techie myself, but things just aren’t user-friendly these days. Take Microsoft Word for instance: I hav used word processors for over a decade now, and they have made their newest issue so complicated that I can’t even figure out how to print. I agree with much of what you say about analog vs digital and you use good examples. Regarding the microwave beep, I can see how it can be annoying and something I wouldn’t want either. However, I have friends who microwave stuff and forget to take it out until after they have eaten. I suppose in those situations the intermittent beeps help. At the risk of overly complicating a feature, a suggestion would be to allow the user to turn this feature off and on….